Since our Beloved was always too shy to wait in the lunch line with other children, the obvious choice was to make her lunch every day. That’s right, every single day. She’s a picky child that only eats certain foods and only if they aren’t touching. People always tell me she’ll grow out of it; many years later I’m still waiting for that to be true. As a Mom, I decide that if I have to make her lunch every day, essentially she’s a captive audience and it’s the perfect opportunity to feed her healthy economical foods. I happened to read several stories about the Feingold diet (no worries, not an affiliate link) which eliminates artificial coloring, additives and salicylates. I wasn’t sure what types of foods would be included so I admit I was leery at first but soon realized that many of the foods we already love are on the acceptable list. We have tried a few new foods and hated a few too, but now we’ve got it pretty much settled upon. I like that I’m protecting [there’s that word] my Beloved’s heart, mind and body with more nutritious options. Do we always eat this way? No. We all love McDonald’s as much as the next family but generally the menu is simple and easy to follow. Now on to the part I know you are dying to hear…as a Helicopter Mom, my job is to offer the best options and easiest path. So yes, when she was born she was breastfed for just a bit over 2 years. I already knew before she was born that this baby was going to have the best of everything that I could offer and for us, breast was best. As a toddler, she had no idea what junk food was and ate what we ate. 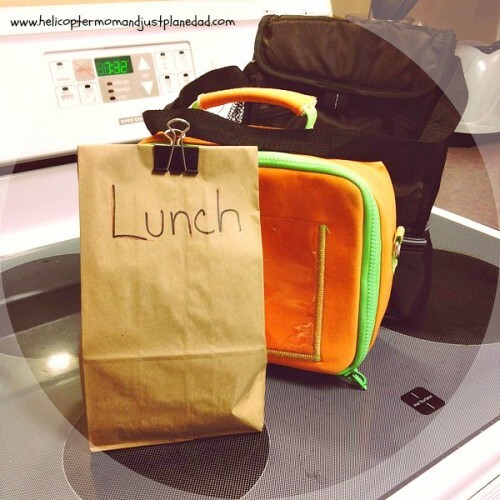 Upon entering school, she’s had a homemade lunch every single day. There are times when I would give anything to stay in bed and forget that I have made this commitment to my family, but then my brain gets the best of me, so I rise at 5am and make the family lunches; mine, Just Plane Dad’s and Beloved’s. Beloved’s is always in a brown bag, apparently the cute character lunch boxes are no longer hip [insert favorite adjective], and consists of the following: thermos meal, cheese stick, goldfish crackers, Yoplait yogurt and occasionally dessert. More nutritious and certainly more economical than the school offers. Because my hovering tendencies spill over to other children too, I do try to speak with the schools about offering better options and more economical choices for our kids meals. I hope that one day our community leaders will assist parent’s with healthier options when our kids are at their “home away from home”. We need to remove the junk food in our life. Until then, I’ll just keep brown-bagging it!